Born in Sta. Cruz, Laguna in the Philippines on April 21, 1937 to Jose O. Manas and Afra F. Aquino. Mama entered eternal life on Tuesday, November 6, 2018 at the age of 81. The only girl born in a family of 6 children. She graduated from Arellano University. 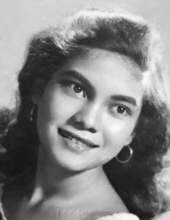 She worked as a secretary in Vietnam, for a Philippine contracting company, where she met the man she was going to marry, the late Doroteo B. Jacob, from Pinamalayan, Mindoro (who was a graduate of the University of the Philippines in electrical engineering and at one time, involved with NASA’s moon landing). They raised a family of five children, Ted, Jacques, John, Jay and Claudine. When all the children were older and after she survived papa, she was able to migrate to the United States and work as a caregiver to the elderly with whom she was an instrument in sharing God’s Word to them. Her sharing of God’s Word did not stop there. She took this calling with her to the time she retired and resided at Fuji Towers. She treasured moments and memories of time spent with children and grandchildren. A generous soul that found purpose in the calling she was called to live. She was Teresa to her friends and colleagues, auntie Tess to her nephews and nieces, Nene to her siblings, Grandma Tess or Lola to her loving grandchildren and Mama to us her children. Mama Tess had a passion for learning and sharing God’s Word to her children and grandchildren. Mama is the woman described in Proverbs 31, a wife, a woman of noble character. A God fearing and Christian and faithful servant of the Lord. A woman of whom God persevered and sustained. She welcomed God’s providential care with childlike faith. Unwavering in her faith regardless of the imperfections of life. Just like every one of us, she had her struggles, but knowing that she has been brought to faith in the saving knowledge of our Lord and Savior Jesus Christ alone, brings peace and comfort to those of us she has left behind. She will be dearly missed. A viewing of her Urn will be held at Cusimano Family Colonial Mortuary located at 96 W. El Camino Real, Mountain View, CA 94040, from 11:00 a.m. to 4:00 p.m. Saturday, November 24, 2018. In lieu of flowers, donations can be made there as well. A memorial service will be held at a later time in the Philippines. To plant a tree in memory of Teresa M. Jacob, please visit our Tribute Store. "Email Address" would like to share the life celebration of Teresa M. Jacob. Click on the "link" to go to share a favorite memory or leave a condolence message for the family.